This report provides a projection and study of the global hops extract market. It provides historical data of 2013 to 2017, along with estimated data for 2018, and forecast data up to 2026 in terms of revenue (US$ Mn) and volume (MT). The report also comprises macroeconomic indicators, along with an outlook on hops extract for the global market. It includes drivers and restraints of the global hops extract market, and their impact on each region during the forecast period. The report also comprises the study of ongoing industry trends and opportunities for the hops extract market. It also includes supply chain analysis. For providing users with a widespread view of the hops extract market, we have included detailed competitive analysis, along with key players in the market, and analysis on the strategies followed by them. The competitive dashboard provides a detailed comparison of hops extract manufacturers on the basis of revenue, product offerings, and key strategies. The study encompasses market attractiveness analysis by nature, product type, application, and region. A detailed study of the hops extract market has been provided by our analysts with the observation of a shift towards the consumption of hops extract over the forecast period. The market is primarily driven by a rise in the consumption of beer across the globe. Though North America and Europe have been considered as the dominant markets for beer consumption, over the past couple of years, Asian countries/regions like China, India, and Australia have witnessed a rise in the consumption of beer, which provides immense opportunity for the hops extract market to grow at a significant rate in terms of volume sales, since hops extract is the prime ingredient for beer production. Apart from the brewery industry, in recent years, hops extract has been gaining traction in the world of cosmetics. Hops is considered as a valuable ingredient in natural skin care products for treating dry and stressed skin. Their sedative properties are also beneficial. In fact, poultices made of hops have been shown to help with skin discoloration. Consumers are increasingly shifting their preference towards natural and organic food products, with intense focus on the various health benefits hops extract offers. Consumers are inclining towards organically produced goods, and this has been dramatically increasing over the last few decades, owing to health consciousness and increasing awareness. The sales of organic food are expected to continue to show double-digit growth during the forecast period. In fact, the demand for organic food is increasing significantly; consumer demand is exceeding some domestic supplies. According to the Organic Trade Association, in 2016, the U.S. organic food market was valued at US$ 43 Bn, an increase of 8% as compared to the previous year. The report includes the company profiles of key manufacturers of hops extract in North America, Latin America, Europe, Asia Pacific, and the Middle East and Africa. For market sizing of hops extract, we determined region-wise beer production, as it is the prime ingredient used for beer production. The data of global hops production was calculated through various secondary sources, and the benchmark for hops extract was determined through various industry factors such as beer production outlook. All key applications of hops extract have been considered based on secondary sources. Some of the key data points involved in the modelling approach include the food and beverage industry scenario, pharmaceutical industry scenario, and personal care industry scenario. The market has been forecasted based on constant currency rates. A number of primary and secondary sources were consulted during the course of the hops extract study. Secondary sources include Factiva and Hoovers, U.S. Food and Agriculture Organization Databases, and company annual reports and publications. This report covers market dynamics related to hops extract, which includes the drivers and trends driving each segment, and opportunities in the hops extract market. The report also includes analysis and insights into the potential of the hops extract market in specific regions. 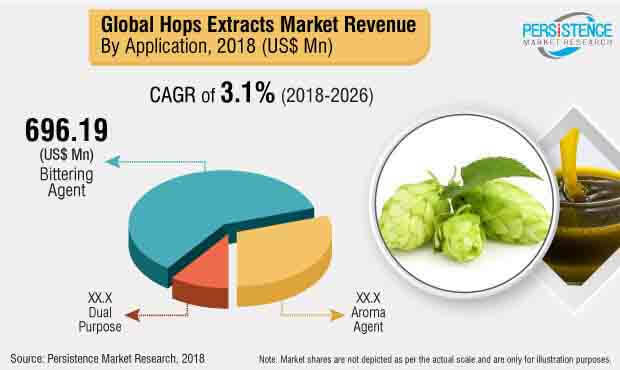 Detailed profiles of the providers are also included in the scope of the report to evaluate their long-term and short-term strategies, product portfolio of hops extract manufacturers, and recent developments in the hops extract market space. Some of the key players analysed are Plantnat Co. Ltd, Naturalin Bio-Resources Co., Ltd, Akoma International Ltd, Hollingbery & Son, Inc, Yakima Valley Hops LLC., Xinjiang Elimnatural Hops Co., Ltd., Crosby Hop Farm LLC., Willamette Valley Hops, LLC, Indena S.p.A., New Zealand Hops Ltd, Hopco Pty Ltd, Glacier Hops Ranch, Inc, BSG Hops, Yakima Chief Hops LLC, Aunutra Industries Inc, and Bristol Botanicals Limited, among other hops extract manufacturers. The data scrutiny for the global hops extract market is estimated in terms of value and volume consumption. To arrive at the volume consumption of hops extracts, production data of countries producing raw materials across the globe has been taken into consideration. In addition to this, the production of application of hops extracts in top producing countries is also tracked for benchmarking purposes. Furthermore, Persistence Market Research has estimated volume data on the consumption of hops extracts for several countries by understanding the demand and supply of hops extracts. It includes production, growth, volume and value sales, transition, pricing, population, consumer preference, and the consumption of hops extract among end user verticals. PMR then determined the volume consumption of hops extract across various regions such as North America, Latin America, Europe, Asia-Pacific, and the Middle East and Africa. Forecasting is done on an internal proprietary model using different macro-economic, industry-based demand driving factors impacting the market and its forecast trends, by identifying and allocating a weighted score to forecast factors that influence the demand for hops extracts. These factors were representative of an entire value chain, as well as macro-economic indicators such as production which have been taken into consideration to arrive at the volume consumption of hops extract in respective countries. Weighted average selling price for hops extract was considered to estimate the market size for top hops extract consuming countries. These prices were captured in their respective countries, and then converted into USD to offer forecasts in one consistent currency standard. Given the characteristics of the market, PMR triangulated the data based on supply side, demand side, and dynamics of the global hops extract market. To develop the global hops extract market forecast, PMR analyzed various factors to understand their respective impact on the target market. However, quantifying the market across the abovementioned segments is more a matter of quantifying expectations and identifying opportunities rather than rationalizing them after the forecast has been completed. It is imperative to note that, in an ever-fluctuating economy, we not only provide forecasts in terms of CAGR but also analyze on the basis of key parameters such as year-on-year (Y-o-Y) growth, to understand the predictability of the market and identify the right opportunities. Another key feature of this report is analysis of the global hops extract market, and the corresponding revenue forecast in terms of absolute dollar opportunity. This is usually overlooked while forecasting the market. However, absolute dollar opportunity is critical in assessing the level of opportunity that a provider can look to achieve, as well as to identify potential resources from a sales perspective in the global hops extract market. To understand key segments in terms of their growth and performance in the global hops extract market, Persistence Market Research has also presented a market attractiveness index. The resulting index should help providers identify existing market opportunities in the global hops extract market. The report covers in-depth analysis of all components of the value chain in the global hops extract market. In the final section of the report, competitive landscape is included to provide a dashboard view of global hops extract manufacturers. According to the American Association of Wine Economist, amongst all other types of alcoholic beverages, beer is consumed in larger quantities in major parts of the world. The U.S. is considered as the largest beer market, consuming around 25 billion liters per year, for most of the past 3 decades. However, there has been a growth in the demand for beer in emerging countries such as China over the past couple of years. China now consumes 20 percent of all beer in the world. Hops extract, being one of the key ingredients used in the production of beer, paves immense scope of significant growth of the global hops extract market in terms of value sales. Hops Extracts are the extract derived from Hops which are flowers of hop plant belonging to Humulus lupulus. Hops Extract are usually used as bittering, flavoring and stability agent in beer. Hops extraction involves various steps such as milling, pelleting, and re-milling of hops to spread lupulin, passing a solvent through a packed column to collect the resin component, and finally the removal of the solvent to provide a whole resin extract product. However, during the hops extract production, the manufacturer incurs comparatively higher manufacturing costs. A notable disadvantage of hops extract perceived by manufacturers is the heating of the hops and its effect on several other ingredients, such as essential oils. Another disadvantage of the hops extract is the slightly higher cost per bitterness unit as compared to whole hops or pellets. The cost varies from 8 to 10% higher with organic solvent extracts, and perhaps as much as 15 - 20% for CO2 forms. In order to cater to this problem, long-term contracts for selling hops extracts are treated as an important instrument to stabilize the market. Forward contracts are a useful means of hedging against price volatility. Unlike spot pricing hops whose price is often unreliable, it is customary nowadays for fixed supply contracts - valid for several years - to be agreed between hops growers and hops traders. These contracts bind the two parties to supply or purchase an agreed quantity of hops of a particular variety at a fixed price. This way, price fluctuation in the hops extracts market as well as production risks are reduced. However, many growers still avoid producing hops on a contract basis. With a rise in the consumption of beer among its target customer, consumers now crave for beer of their most preferred flavors added on it. Since the past couple of years, there has been a rise in the demand for flavored alcoholic beverages. Owing to the need and demands of target customers for flavored beverages, some of the leading spirit manufacturers are investing significantly to create flavored drinks in order to cater to the changing tastes and preferences of consumers. Also, the trend for low alcohol content is growing rapidly. Manufacturers are strategizing on coming up with various hops extract flavors namely Perle hops extract, Hersbruck Spaet hops extract, Opa hops extract, Cascade hops extract, Centennial hops extract, Cluster hops extract etc. However these flavors differ from region to region. The global hops extract market is majorly dominated by Asia Pacific, due to the rise in production of beer in the region. Countries like China and India are the major consumers of beer, which is directly proportional to the consumption of hops extract for the production of beer. The U.S. and Germany are major producers of hops, which plays another pivotal role in driving the growth of the hops extract market in North America and Europe.